Welsh Cycling has named the four riders who will form its at this season's World Cup events, starting in Colombia next week. The new team has been formed to develop the burgeoning young Welsh talent. Representing Team SWI Welsh Cycling will be Jon Mould, Ciara Horne, Amy Roberts and Elinor Barker. "The 2012/13 track season is part of a learning process for many of our riders," said Welsh Cycling head coach Darren Tudor. "The Track World Cups will provide them with the experience of competing on the international stage. "Team SWI Welsh Cycling is part of a long-term project that will aim to deliver riders to the podium programmes at British Cycling. "Major targets for Team SWI WC include the Commonwealth Games in Glasgow in 2014. In the meantime, we will work to deliver riders to British Cycling with the hope of success at Rio in 2016." Barker is the world junior time trial champion, double world junior track championship medalist Roberts will compete in the endurance events, with Horne making the trio for the women's team pursuit. Mould is a former European and national track champion. The expectation is that the new Welsh team will allow rising talent to emulate the likes of Becky James, who represents Great Britain and claimed four national titles at last month's British Cycling National Track Championships. Team SWI WC will travel to all three rounds of the 2012 UCI Track World Cup series in Cali, Colombia, 11-13 October, Glasgow, Scotland, 16-18 November and Aguascalientes, Mexico, 17-19 January. 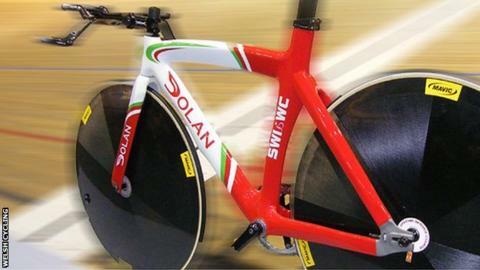 There is also the potential for additional athletes to join the team later in the series as Welsh Cycling buils towards the 2014 Commonwealth Games in Glasgow.